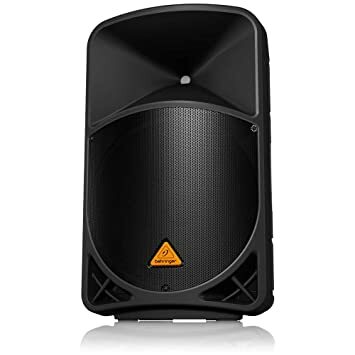 What should I look for when shopping for a wedding DJ? El Folio Entertainment does a very limited number of wedding events per year - ONE per service per date. Consider it like being served a gourmet dinner in a fancy restaurant, each client as a diner, one of the few people lucky to be there. Then, put that against waiting in line at a fast food restaurant, waiting for your order to be thrown together as clumsily as the last one was. Think about the detail and service that's sacrificed between either example. We're serious when we say that the 'care factor' is one of the most important things about being a good wedding entertainer - of course experience and professionalism is (and always will be) a must, but remember that can't be compromised with lack of human contact and communication. This can not be a "conveyor-belt" experience. The person on the other end of the phone is the person who will be Djing at your wedding, as it should be. Planning for a wedding is a lot of work, and it can be a process that is lots of fun, or very difficult - depending on who works with you, versus against you. Don’t forget that this is YOUR day, and that YOU’RE the one paying for the services. Don’t let any DJ service (or other vendor for that matter) disagree with you in the creative aspect of your planning. For example, if you wanted to hear a song from the eighties that may seem obscure or out of the ordinary (but you want it all the same), don’t let the DJ reject that request or laugh in your face. A good wedding DJ is open-minded, and although he’ll offer recommendations, he’ll NEVER force something down your throat nor will he ever tell you “no”. To the same effect, feel free to put him to work for the amount of money you’re paying... give him a playlist if you want, give him a ‘do-not-play’ list if you want. Whatever DJ you choose, make sure that he/she respectfully acknowledges your needs and acts on them. Anything less should be considered a red flag. This is probably the most honest thing a DJ will do to earn your trust, because it relies on the testimony of former clients through e-mail or phone. Those former clients have openly volunteered to give insight to the quality of service, as well as business ethic. It's is VERY important to insist on referrals from your DJ service. El Folio Entertainment offers a long list of referrals on request. Our referral list not only contains the contact information of former clients, but also the planners and coordinators of reputable venues throughout Vermont. This happens too often, and it really bothers me. Imagine: you hooking your iPod up to the sound system and just have it randomly play with gaps between music throughout the night. That's pretty much the experience you'd have with a DJ that cues up the music on his computer (or ironically even HIS iPod) to a random mix, while he just sits back and reads a magazine. Even if it's the sequence you've asked for, or the music you've asked for, your money pays for an attentive human being watching every component throughout the whole night, interacting with the crowd and adjusting. Anything less, and you might as well just be hooking up your iPod and setting the sequence yourself. El Folio Entertainment will never substitute a computer or iPod for a professional DJ (unless it's called for... i.e: during dinnertime or short excused restroom break). As mentioned before, being a DJ is a job... not an ego. A good DJ is charismatic enough to speak lively to the crowd without having to sport a cartoony voice or sound goofy. A DJ has to have the capacity to pay attention to the needs of a crowd and adjust accordingly. El Folio Entertainment has prided itself on keeping up with the needs of audiences and adjusting on the spot to make sure the whole audience is engaged and entertained. It's our strict attitude that the bride and groom are the stars of the evening... not the person playing music. Do you know somebody who chose their DJ for their wedding because they saw him rock the house at a club? Be careful about who you choose, because a DJ who usually does mostly club work is usually not such a good wedding DJ. Clubs are meant to be upbeat and keep people dancing with the new music and club bangers; not to mention they're designed for people over 21. Weddings are meant to be sentimental and incorporate music from all generations so that everyone is happy and entertained. I've heard horror stories about weddings who hired a DJ who works at the local nightclub and played nothing but rap music [the explicit edits if I may add]. Needless to say, neither of the families were quite impressed. In fact, the loud music made people leave and kept the dancefloor empty. El Folio Entertainment, on the other hand, incorporates music that is suitable for all generations at weddings. With a vast variety of music from generations ranging back to the forties, we make it a point to play music that will keep everyone entertained - even grandma. Weddings not only have the bouquet toss and the garter ceremony, but sometimes throwing in the YMCA or other favorites helps everyone have a better and more memorable time. El Folio Entertainment also works very closely with the bride and groom for pre-consultation, so every song that comes out of their speakers is tasteful and entertaining. Find out from the referral list provided how the overall experience is, based on the experience of past clients. As another client, they can give you the most honest insight to how the DJ does business, how reasonably the price met the expectations of the client, and finally, how well the service was. Our most recent package rates can be found on our rates page. Q: May I meet with you before booking? Absolutely. We'd need to plan a date and time based on our availability, as well as a location workable enough for the both of us. We travel the state much more during our prime wedding season, so it might be a better time to intercept us. We are also pleased to meet via Facetime or Skype when it's mutually feasible to save gas. Q: What happens if somebody else requests my date? Our policy is a rather simple one. We will only honor ONE client per date - that is the client who submits their deposit first. In the nature of this business, it's not unusual to send out multiple contracts to multiple clients for the same date - even if only one is going to be honored. This is because over the course of booking months in advance, plans can change during the process of planning a wedding. In the past, some people eventually decide on options other than a DJ, for reasons of: finance, date change, family emergencies, resources, conflicts, and so on. Therefore, we may send out more than one contract per date. This way, nobody is left uninformed, business isn't refused, and we can help you find another Vermont DJ through our consultation and recommendation if somebody else acts on the date you wanted. El Folio Entertainment will NEVER cancel an event once it's confirmed, nor will we accept a better-paying event for that date through another party (as some DJ companies do, which is really unprofessional and annoying.) We try our best to maintain fairness between all parties, and we gladly accept input from any and all of the people we do business with. Q: How soon should I act after I receive the contract? In a year, there are approximately 52 Saturdays and 52 Sundays (104 dates total). In the same year, we receive over 500 requests to fill those dates, (most often on Saturdays and Sundays, which are prime wedding days of the week.) Brides, grooms, parents, and vendors come to our web page to make requests for their special dates. Unfortunately, most of those requests get turned down because those dates are already filled by others. If you are lucky enough to find your date available, and you request a contract, there is still always the chance that somebody else might want the date as well. To ensure that your date is confirmed before anyone else has a chance at it, the best thing to do is to act as soon as possible. We offer an online wedding planner which allows you to pay your deposit online - once that's paid, you're confirmed. If you'd prefer, you can pay your deposit by check instead. Q: Do the times on the contract include setup time? Absoultely not. We are set up and ready to go before the contract time begins. The time on the contract is the period of time in which we actually render service. No extra charges for setting up, of course. Q: How do I check to see if my date is available? Q: Do you have any awards? Yes. We don't like to boast, so we prefer to let our past clients represent their experience with us. Since 2009, we have held a 5/5 score consistently on WeddingWire and The Knot alike. Q: How long have you been an entertainer? Like many of the clubs you frequent, many songs are transitioned and matched back to back in clever fashion spanning from 70s funk to Uptown Funk. Toss in a little Beatles and Michael Jackson, and you have a reception that'll keep everyone moving right up until the venue has to boot us out. Q: What can I expect/not expect for my investment? ...come dressed ONLY in the appropriate attire for your wedding (or other special event). ...arrive with ALL of the information you've provided: via our online planner, via e-mail and via special request. ...use GPS technology to accurately find your event location and always arrive punctually. ...arrive with ALL of the special music requested, whether or not it's on our music database. ...answer ALL of your questions promptly and professionally. ...accommodate requests and improvise throughout the night as necessary. ...engage the audience, no matter what the age. ...WILL NOT alienate members of the audience with music that caters to only ONE genre. ...WILL NOT play music with explicit or suggestive content. ...WILL NOT be boisterous or overpowering on the microphone. ...WILL NOT play music off an iPod. ...WILL NOT subcontract other DJs or DJ companies (some guys charging $1000+ will... be aware of this). ...WILL NOT flash company banners or promotional materials which may appear tacky and distracting at a wedding (however we will provide business cards upon request). ...WILL NOT attempt to use dumb gimmicks (such as magic tricks, jokes, cartwheels, etc). ...WILL NOT blast the audience out of the room by having speakers too loud. ...WILL NOT smoke, or arrive intoxicated (you never know nowadays). We are always pleased to take and play requests, provided that the request is NOT on any do-not-play instructions provided in advance or if, in our judgment, the request will deminish the energy out on the dancefloor. Q: Will you find all the songs we'll want? With ample time, I'll be pleased to attain any musical selections you'll require for your evening, provided that they are available via a legal method which I would be available to purchase them from. iTunes store is a good example. We are also pleased to play music you may already have and could provide. We require that all payments be received and cleared two weeks prior to the event. We accept checks, VISA, Mastercard and Paypal. For more information on making payments, please visit our advance payments page. Although we prefer checks, you may make payments by VISA or Mastercard to pay off your balance. Because of credit card processing fees, there is a payment schedule after a certain amount is charged. See fees here. Q: Am I supposed to tip my DJ? Although most of our clients end up giving a gratuity, they are NEVER expected - but MUCH appreciated. 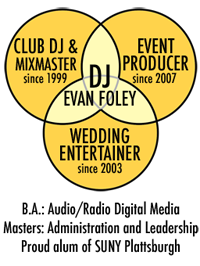 If your DJ went above and beyond to meet or exceed your expectations, we hope you consider it. A typical gratuity ranges between $50 and $200. Q: Do I pay tax in addition to the price I'm quoted? No. Tax is included in your total, and filed by us later on. Q: Do you offer military and first responder discounts? Absolutely. We are proud to assist those who serve both our country and our municipality to make our lives safer and better. Please visit our rates page and look for our discount box. Q: Do you include uplights? Absolutely! With every wedding, we include transformative uplighting that will make your event very memorable for the whole night (at no extra cost!!). We recommend that your event be at night or in a dark environment to optimize our lighting experience. Q: What other addons do you offer? we offer some very cool add-ons to make your wedding more memorable. Keep in mind that they are not included in standard packages, but must be selected with your online planner. Q: Can you stay longer than planned? Absolutely. We understand that it always makes for a better night when people want to stick around (including the DJ). We never make other commitments on the night of your event, so there is no pressing need for us to dismiss ourselves at the ending contract time. When it comes to extra time, we charge by the hour (smallest time denomination is $100 per extra hour). Keep in mind that this is the same rate for additional hours that we charge during primary preparations of the contract - there are no additional fees or obligations when the adjustment is made on the spot. We do require, however, that the extension you're requesting is cleared with the people managing the venue. Q: Do you offer souvenir or demo CDs? Mobile DJs have a code of ethics and are not licenced to reproduce copyrighted material in exchange for money - I'm no exception. To ensure the longevity of my business, I can't offer illegal party favors. Sorry. If you're simply looking for samples of my work, The best thing that we have readily available to offer which speaks towards the benefits of our business is the extensive list of referrals (which are included with every contract) as well as the testimonials we offer on our website from reputable review sites such as WeddingWire and The Knot. The people on our reference list would be happy to enlighten you, as far as their experiences were with me, as well as insight to my business ethic. I only use the most reliable and recommended equipment for my business. We only use the most high-fidelity audio and never compromise. 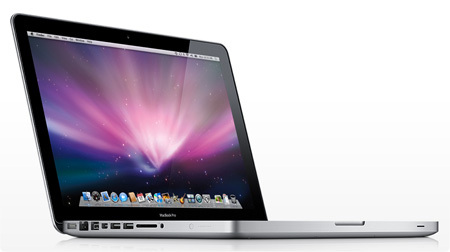 Powerful computer which is the industry standard boasting solidarity and power across many different fields. Commandeers every part of music playback, and will also control a USB thumb drive containing music in the event of a laptop interruption. Zero cutouts… industry standard used by musicians of all kinds for both stage and studio applications. 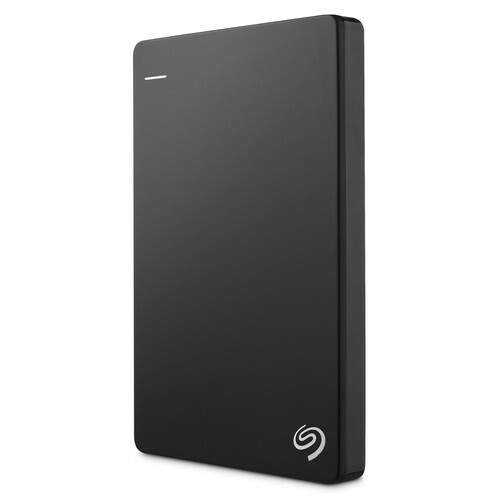 Full music library also concealed on external drive for easy access in case of emergency. Legitimate and reliable, El Folio Entertainment has been a subscriber for years. Although everything we use is professional grade, we never rely on a single piece of equipment for anything presuming that it will never fail, or simply complete it's life and 'kick the bucket'. For this reason we are always looking for the 'achilles heel' of our operation, finding ways to fail-proof it. We have backup mixers, controllers, speakers and fuses on hand at all times, because not diffusing a piece of failing equipment can compromise the experience. We also keep another computer on backup with our full library. Q: Are your songs edited? As you know, many of the songs that are used to make a wedding reception great do NOT have curse words in them. For some newer selections, however, we insist only upon radio edits. Like we said, it's important for us to make sure that everyone is involved (and not offended). Q: How loud do your speakers get? Our speakers have the capacity to get really loud while maintaining crystal clarity - but that doesn't mean we'll use all of the power at our disposal. We will make the music loud enough to fill up the room, without driving everyone out of it. ...WILL NOT consume any alcohol. Q: Do you have a wireless microphone for toasts? Sure. 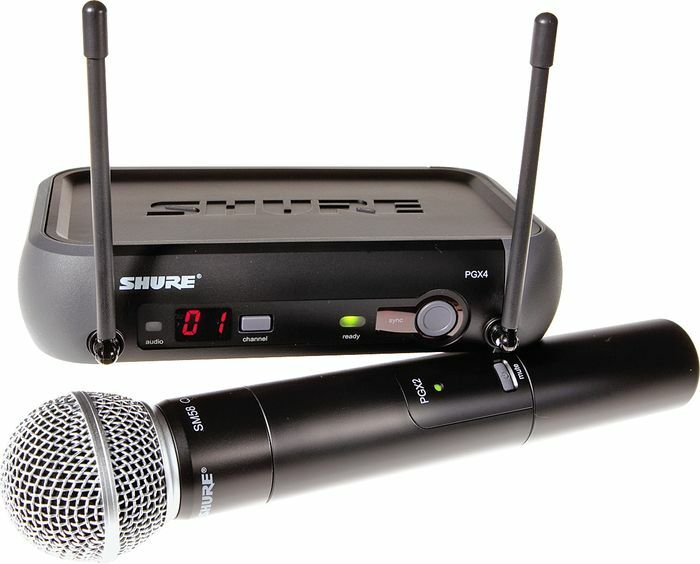 In fact, all packages include a reliable Shure SM58 wireless series for your convenience. Q: How do I log into the client area? In the navigation bar above click "Client Login". The next page will prompt you for the date of your event and your password. Q: Where do I find my password? If you are still having trouble locating your password, email us and we will send it to you promptly. Q: How do I plan my event online? Find the "My Event" tab in the planner. On the righthand side you'll see the worksheets pertaining to your event. Fill in these details at your leisure in the time leading up to your wedding. by my talented wife at dianafoley.com.